Three men have been jailed for fire-bombing a house and a temple after being angered by the marriage of a Sikh woman to a Hindu man. Sikhs Sandip Rooprai, 21, Mukham Dogra, 18, and his brother Jasdev Dogra, 19, acted out "a misguided sense of honour", Winchester Crown Court heard. 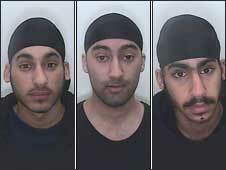 All three men, from Swindon, Wiltshire, had originally pleaded guilty to arson. A jury found them guilty on two counts of arson with recklessness as to whether life was endangered. Rooprai became incensed when his sister married a Hindu man, and he persuaded the Dogra brothers to help take revenge. A judge at Southampton Crown Court sentenced Rooprai, of Penhill Drive, Swindon, to nine years in jail. Mukham Dogra, of Cowdrey Close, Toothill, was jailed for seven years and four months and Jasdev Dogra, who lived with him, was jailed for five years and eight months. The attackers targeted a Bristol temple and the Swindon home of a wedding witness in early 2008. After the case Det Ch Insp Bob Hamlin said: "This series of offences could easily have led to the deaths of one or more occupants of the attacked houses. "The third attack in particular, was a planned, concerted effort aimed at endangering the lives of those occupants who were in their beds."